Southwest Environmental Limited undertake a wide variety of sustainability reporting for architects and developers. Simple or Complicated we can provide a quote so please contact us. More and more often we see the the impact of sustainability on planning application and build methods. Local / District Planning authorities may ask for sustainability statements. Whilst mandatory sustainability elements are ever increased with the Building Regulations. The New Part L documents will be more more stringent than ever when it comes to sustainability. Although capital outlay for sustainability initiatives can be higher, the building will enjoy lower running costs, owing to reduced energy and water usage. This is why projects such as schools (for example) benefit from systems such as BREEAM. Some authorities will require an Energy Statement to spell out Building Regulation Requirements for energy efficiency and generation. A step further, and you might consider the Passive House (Passivhaus) Standard. Please feel free to telephone the office for an informal discussion regarding any of the services we provide. How to write a Sustainability Statement What information is in a Sustainability Travel Plan? What is a transport assessment report (TAR)? What are the thresholds over which a development requires a travel plan? Why do I need a sunlight / daylight assessment? Where can I get a Construction Management Plan? What water sustainability issues are there in the UK? What water sustainability issues are facing the world? Which building materials are the most sustainable? BREEAM What are the different BREEAM sustainability assessment methods. What are the Lifetime Homes Design Sustainability Criteria? BREEAM example sustainable projects in the UK - Schools What is the Passive House Standard? What are the most cost effective sustainability measures? What is an Environmental & Energy Strategy? How can Life Cycle Assessment Help when considering Sustainability? Which Solar Panels are the most Sustainable? What information is in a Sustainability Travel Plan? A Sustainability Travel Plan sometime called a Green Travel Plan, or a Mobility Management Plan is a document that set out measures to be undertaken by employers to encourage staff to use a sustainable form of transport. In particular this should discourage forms of transport that involve private cars. Developers etc. may be asked to complete a travel plan if your project is over a certain size, see thresholds for travel plans. A systematic approach is best adopted from the very beginning of project inception. Prioritise your aims in terms of there importance, achieving the lowest levels for obtaining your desired awards for example BREEAM, your should concentrate on making sure that the minimum requirements are met. There is little point in exploring exciting innovation options until you have made sure that your basic management systems and basic requirements are met. The flow chart to the right details priorities that may be assigned to various sustainability elements of a project looking to obtain awards under schemes such as BREEAM or the Code for Sustainable Homes. If you are looking to undertake a project and have aspirations or planning obligations that it be assed under BREEAM or the Code for Sustainable Homes then please contact SWEL, and we can discuss your needs, and review your intended route accredited sustainable construction. The Code for Sustainable Homes is an Assessment Methodology introduced by the BRE. In the guide IP 4/05 the BRE explore the perceived extra costs associated with achieving code for sustainable homes at various levels. Some typical percentage increases are listed below. CSH Code for Sustainable Homes may force you consider passive ventilation which is why there are cost reductions associated with the offices built to CSH. An Environmental & Energy Strategy is much like a Sustainability Statement, it sets out a projects environmental energy, and sustainability aspirations at the planning stage. Local councils may wish to see commitments to sustainability measures beyond those specified in the Building Regulations in your projects Environmental & Energy Strategy. The report may look in to various options for sustainability measures to find out which are most cost effective. If the project intends to adhere to the BREEAM or Code for Sustainable Homes Initiatives then this will be mentioned and elaborated upon in the Environmental & Energy Strategy. Which Solar Panels are the most Sustainable? To the casual eye the two solar panels look very similar but the technology in side is very different. The one to the left produces electricity, the one to the right produces hot water. But which is best? The answer is that Hot Water is best but only up to the amount you can make use of. If you want extra then . . . . Electric Photovoltaic Panels. Why? A hospital in the planning phase needs to outline emissions reductions to the tune of 20%. 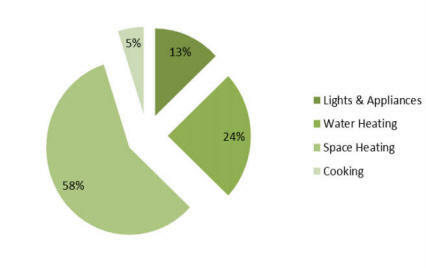 17.5% of the building energy demand will come from heating water, for washing and bathing etc. So we can use solar thermal panels for this, generating 700 KWh / pa / m2 we install 48 m2 to provide 17.5% of the buildings energy at a zero carbon rating. 35 m2 photovoltaic panels meets the remaining 2.5%, as they only produce 140 KWh / pa / m2. So as a rule maximise hot water panels, and then top up with PV panels. Hot water panels can also be used for space heating if combined with a thermal store of some kind, although heating seasons will be short. Find out why solar panels for hot water are perhaps a better option than solar panels that generate electricity. Which locations do SWEL cover? We will provide Sustainability Consultancy Services in any part of the UK, we have offices in London, Bristol and Exeter. SWEL can provide Sustainability Teaching Program for delivery in Schools, Institutions and Workplaces. We make the events fun and memorable. Prizes are given for answering questions etc. Practical experiments are undertaken during delivery window. We can deliver metrics for improvements in understanding. For more detail on the Teaching Program please click here.